The VK 45.03 is a German tier 7 premium heavy tank. Heavy tank developed at the end of WWII. The project was designated the Tiger III (VK 45.03) on October 12, 1942. Existed only in blueprints. Don't make the mistake of comparing this to the Tiger I. The Tiger I can burn down every T7 and even T8 tank by utilizing its raw DPM power in combination with its HP pool of 1500, when given the chance. While the VK 45.03 does not stand to far off with regards to HP, the DPM is an absolute joke in comparison. It does not offer significant mobility advantages over the Tiger I, in fact it gets beaten in the top speed department. Also don't get hyped because of the angled front plates. They do offer improved protection compared to the flat hull design of the Tiger I, but it is nothing to rely on, especially when fighting tanks of your own tier (and higher). Even the IS, its derivatives, and the KV-3 with only 175mm of penetration, have a good chance of penetrating the upper front plate, even when angled with effective values of +-140mm armor (don't shoot the lower plate as it offers better protection due to sharper angle). The turret, however, offers mostly no angles, and with a nominal armor protection of 100mm that does not yield a much higher effective value in most places, it presents an easy target even for lower tiers. So in essence, one has to make the VK 45.03 work by using the gun handling. In comparison to the Tiger I, the VK 45.03 offers lower aim time and better gun soft stats, which means you build up less dispersion by driving and turning the hull / turret and you take less time to achieve maximum accuracy (aka letting aim circle shrink to its minimum). The VK 45.03 has lesser damage potential over time than the Tiger I, but has an easier time making its shots count. Don't try firing snapshots, as you don't have the DPM to effectively trade 2 shots for 1 against tanks with higher alpha. It is better to not to get hit and dealing no damage in return, than to eat 390 (or more) to deliver only 240 damage on average. What's more, with the improved gun handling, you will land such shots more consistently than with the Tiger I. It should also be noted that the VK45.03 can easily use Optics for its third equipment slot and participate in active scouting duties more effectively (first and second being rammer and vents respectively), whereas with the Tiger I giving up the Enhanced Gun Laying Drive is a much tougher choice. Front view of the VK.45.03(H) in the Garage. The VK.45.03(H) is the designation given to the first prototype of the infamous German Tiger II Heavy tank. In the autumn of 1943 the Henschel firm presented their proposal for a new heavy tank to succeed the Tiger I. The vehicle was to weigh 65 tons, with hull armor consisting of 100/80/80mm (front/sides/rear) and was to be equipped with a Porsche turret with front, side, and rear armor identical to that of the hull. The prototype was to be armed with an 8.8cm. Kwk. 43 L/71 main gun, mounted in a monobloc (single-piece) gun mantlet. The design was rejected as the Führer personally intervened to increase the frontal armor armor of the vehicle to 185mm; and the Weapons Department determined the rounded Porsche turret to be inadequate as the lower rounding could potentially cause shells to ricochet into the hull roof. Development of the VK.45.03(H) began after the Führer conference on May 26, 1941. The conference decided that the German Army Weapons Department should speed up existing research and development programs on heavy tanks in the 30-45 ton weight class being carried out by Porsche and Henschel. At this time, the Weapons Department also instructed Krupp to an improved tank gun version of the famous 8.8cm. FlaK 41 anti-aircraft gun (the 8.8cm. KwK. 43 L/71). Development was hastened after the invasion of the U.S.S.R, due to the shock of the first combat encounters with the soviet T-34 and KV-1 tanks. At this point the goal was to create a vehicle with greater firepower and protection than any Soviet tank in existence, as well as any tank the Soviets might develop in the immediate future. By late 1942, Porsche had begun development on two vehicles, the VK.45.02(P) Ausf.A & VK.45.02(P) Ausf.B, however, development on these vehicles was eventually dropped as they used a similar transmission to the Tiger(P), which not only had been proven unreliable, but also required large amounts of copper, a resource in short supply by late 1942. In autumn 1943, Henschel presented their proposal for the new heavy tank designated Tiger H3. The vehicle was to weigh 65 tons, with hull armor consisting of 100/80/80mm (front/sides/rear) and was to be equipped with a Porsche turret with front, side, and rear armor identical to that of the hull. The prototype was to be armed with an 8.8cm. Kwk. 43 L/71 main gun, mounted in a monobloc (single-piece) gun mantlet. The design was rejected as the Führer personally intervened to increase the frontal armor armor of the vehicle to 185mm; and the Weapons Department determined the rounded Porsche turret to be inadequate as the lower rounding could potentially cause shells to ricochet into the hull roof. 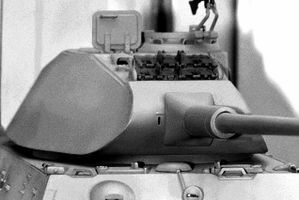 Although no prototypes of the original design were produced, the first 50 Tiger II tanks produced would be equipped with existing Porsche turrets. Model of Henschel's VK.45.03(H), now on display at the Munster Museum. Tiger II Prototype, note the monobloc gun mantlet on the turret. 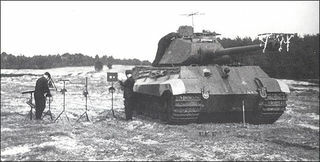 Tiger II Prototype with early Porsche turret undergoing firepower trials. There's many inaccurate and flaws in description of this tank. The tank was never named as Tiger III, Since it was actually Tiger II early design. The tank is really exists as prototype of Tiger II. The turret was made by Krupp, not Porsche, and was used by the first 50 Tiger II tanks as built by Henschel. Hart, S., and Russell Hart A. German Tanks of World War II. New York: Barnes & Noble, 1999. Print. Bocquelet, David. "Panzer VI Ausf.B Königstiger." Tanks Encyclopedia. Tanks-Encyclopedia, 29 Apr. 2015. Web. 22 Sept. 2016. Bourguignon, Vincent. "Panzerkampfwagen VI Tiger II Heavy Tank." WW2 Drawings. War Drawings, 24 Sept. 2015. Web. 22 Sept. 2016. Aviarmor Editors. "Pz.Kpfw.VI Ausf.B “Tiger II”." Aviarmor.net. Aviarmor, 18 June 2015. Web. 22 Sept. 2016. This page was last modified on 22 January 2019, at 22:26. This page has been accessed 48,181 times.